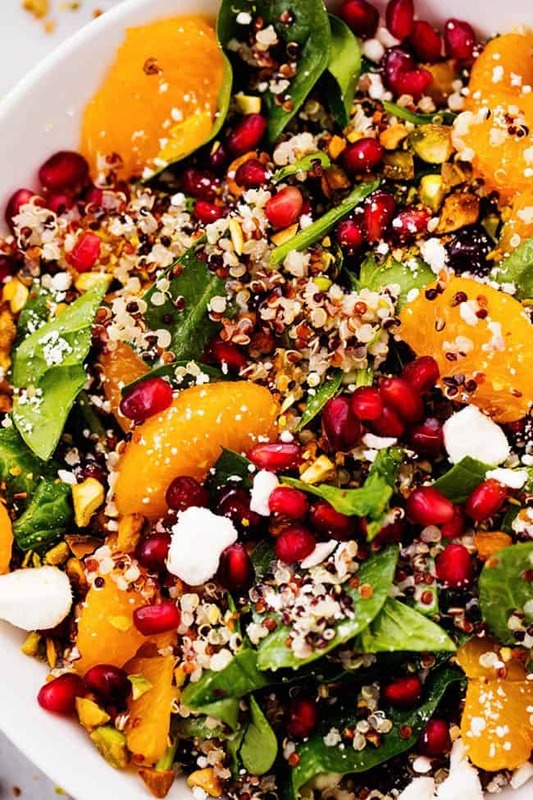 A mouthwatering winter salad with quinoa, spinach, mandarine oranges, and crunchy pistachios. Topped with a creamy lemon greek yogurt dressing and feta cheese this makes one unforgettable salad! We are about half way through the month. How are those resolutions going? Did you know statistics show that most people forget about their goals two weeks into the month? I have been known to do that before but eating a healthier diet should become apart of your lifestyle. Add a delicious salad here and there and substitute common ingredients for some healthier choices. If you are looking for a delicious salad you have come to the right place. I have grown to LOVE salads. Did you know that I used to hate salad? Yeah I did. I always wondered how people thought “leaves” tasted good to eat. I started adding them to my diet and have learned that salads are delicious! I sure do miss my strawberry salads, but with some winter fruits I was able to put together a mouthwatering salad for lunch. This salad is kind of all of my favorite things about winter. Pomegranate, oranges, and pistachios all remind me of the winter time for some reason. Maybe because I always get a big bag of pistachios from my dad for Christmas… But I sure love pistachios in a salad. 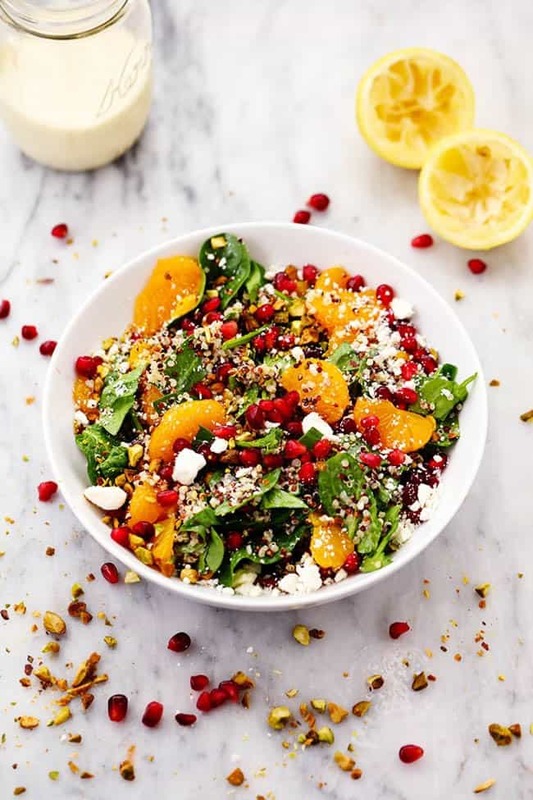 The crispy fresh and salty pistachios throughout this salad made every bite perfect! The great thing about this salad is that it comes together in just a matter of minutes. The dressing is full of delicious citrus flavor and the creaminess tops the salad perfectly. I made it with greek yogurt which adds a healthy and tangy alternative to other common used ingredients. Cook quinoa according to package directions. Let the quinoa cool for 10 minutes. 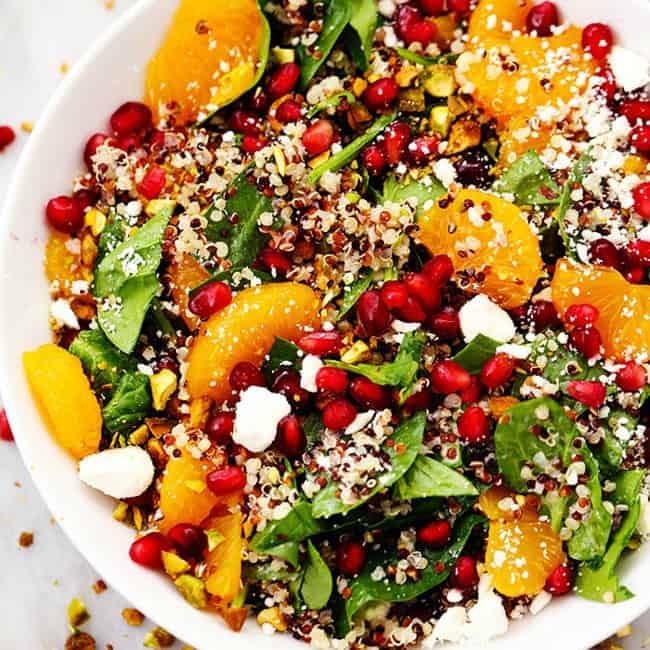 In a large bowl combine quinoa, spinach, mandarine oranges, and pomegranate and lightly toss. To make the dressing: In a small bowl whisk together the lemon, apple cider vinegar, sugar, garlic, greek yogurt, olive oil, salt and pepper. Drizzle desired amount on salad and toss. Top with pistachios and feta cheese. You guys are going to love everything about this salad. 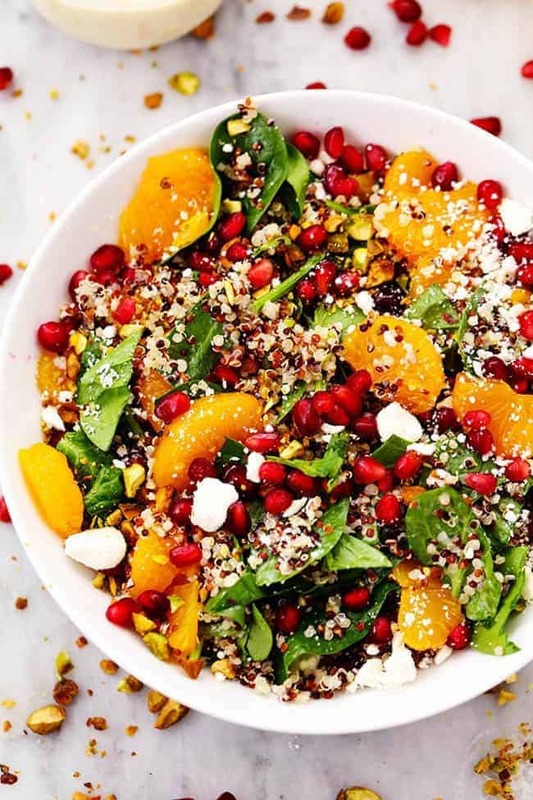 The pomegranate, mandarine oranges and all of the textures and flavors combined to bring you this amazing salad. This will be a salad that you will want to make again and again! This salad is the mother of all salads! I can just imagine all of those different flavors. What a great combo…thanks for sharing. We had this for dinner tonight, and it was divine! And last night we had your creamy lime cilantro chicken and it was to die for! I just made this again, with the first pomegranate of the season. I love having salads I make on the weekends and then pack for lunch throughout the week. This has a great mix of textures and some unexpected flavors (in a good way). Nice change up from the usual quinoa salad.